The organization serves homeless young people. HELL’S KITCHEN — A West Side refuge for homeless youth will get a sparkling new home topped with affordable housing, according to city documents. 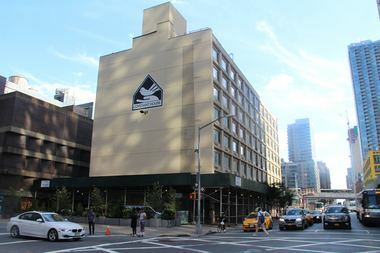 Covenant House, located at 460 West 41st St., will get a “state-of-the-art facility” that will house its national headquarters as well as local programs, the city’s Economic Development Corporation confirmed. The new development will also build housing that is approximately 40 percent affordable, including 100 units of supportive housing, EDC confirmed. The new complex will be constructed between West 40 and 41 Streets and 10th and Dyer avenues. That lot currently contains the current Covenant House building, the now-vacated Hunter College Voorhees Campus, which is city-owned, and a Port Authority parking lot and bus ramp. In a June 30 letter to the EDC and the Department of Housing Preservation & Development, Community Board 4 also requested that the development plan preserve and restore the West 40th Street Carnegie Library. They want 50 percent of the affordable units to be 2-bedrooms or larger, and they want to make sure all units are permanently affordable. The plans account for a revival of the West 41st Street 7 train station, which was initially part of 7 train expansion plans but was ditched due to cost overruns. The plans “provide an easement for a ventilation building for the future Number 7 line West 41st station extension."